At last! Back from vacation. Back to resolutions and photos and all the good things I want to do. Back to working my way through the Big Book O’ Photo Prompts. Today’s photo prompt is: Blue. And for some reason, I struggled with this. I mean, the ocean is abundant, the sky is everywhere, and everyone loves blueberries, right? Even though blueberries are actually some weird blue that’s more purple…but I digress. And I wasn’t opposed to using one of those things as my subject but I just couldn’t come up with anything…good. Creative dry streak. We all have them. So I recently had the opportunity to visit London; I’d been there once before but the trip was far too brief. This time, I was there for about a week and…well, frankly, that is STILL far too brief, but at least this time around I got to do some groovy stuff and see some great things. 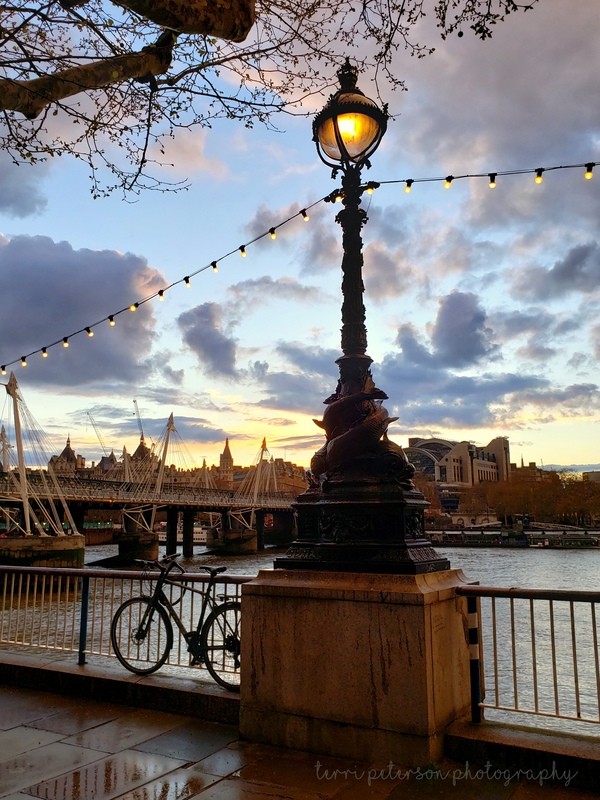 One thing we did…more than once…was get a drink at The Understudy on the South Bank, which has this great outdoor seating area where you can plant yourself for hours when the weather is fine. And the weather was fine the week we were there, with temps going up into the high 60s (that’s 18-20, for my Celsius friends, and really, the weather was extraordinary), barely any rain, and no real clouds, except to make it interesting. While leaving The Understudy on the early end of one of these very fine evenings, I couldn’t help but pause. It was the start of the “blue hour“, the period of time before sunrise and right at sunset, when the sun is slipping below the horizon and turns everything blue behind it. It’s one of the celebrated times to make a photograph, because the light is strong and interesting and casts a luminous glow on pretty much everything it touches. Behold the mighty River Thames, as the blue hour creeps in. Raise your hand if you want to Photoshop Mary Poppins riding in on her umbrella. Today’s letter is “S” for “Serenity”. And “Sky”. Like I said, I wanted to come up with something good. This was the “blue” story I wanted to tell.